Unchurched and free-thinking – sometimes anti-clerical – Slovenian immigrants decided in 1913 that they needed a center for their activities in Waukegan. They also wanted a large meeting hall for the wider Slovenian community. Fours years later, after endless selling of shares house-to-house, raffles, dances, and bazaars, building began: The shareholders did all the work. The cornerstone was laid on November 3, 1917, and the “Dom,” as the Slovenians called it, was completed at the end of December, 1918. The hall’s location at 424 10th Street was not accidental. First, it was just a few blocks away from the main entrance to American Steel and Wire, where many Slovenians worked. Second, 10th Street was the Southside immigrant community’s downtown. Third, and perhaps most important, it was located just east of Mother of God, the Catholic Slovenian national parish. The free-thinkers, therefore, were asserting their presence within the community. The Slovenic National Home was the immigrant community’s largest meeting space and cultural center. On the upper floor, its large auditorium sat 1200. On the top floor, it had six offices that it rented out. The street-level floor had a leased office as well as the shareholders’ club. There were smaller meeting spaces in the basement. Balina courts were on the lawn east of the building. For the next 40 or so years, numerous organizations created by first-generation unchurched and/or left-wing Slovenian immigrants met at the Home. Other ethnic groups, particularly left-wing, also used the building because of its size. Finns, for example, sometimes used the auditorium for plays they thought would attract an especially large crowd. The Slovenic National Home played a critical role in the 1919 steel strike when it served as strike headquarters: The regular Sunday rallies and the weekly closed meetings of the strikers were held there. A typical Sunday rally featured the largely Finnish American Steel and Wire Band, musical performances in a variety of languages, and a prominent speaker. Mother Jones came in to rally the strikers in mid-October. When the city fathers decided to restore “order” in Waukegan, one of the things they did was to close down the meetings at the Dom. The strikers moved them to the considerably smaller Workers Hall. The Dom continued to serve the labor movement well after the 1919 strike. Seven of the locals that the Steelworkers eventually organized in Waukegan and North Chicago met at the Slovenic National Home as did several other CIO unions. (By contrast, the skilled-trades unions almost always had their offices in the downtown area.) In its early years, the Lake County Industrial Union Council also met there. In 1988, there was still enough commitment in the Slovenian-American community to celebrate the 70th anniversary of the Slovenic National Home with a dinner and polka dance. American Steel and Wire retirees and the SNPJ (Slovenic National Benefit Society) still were meeting there, but bingo and rentals were keeping it afloat. 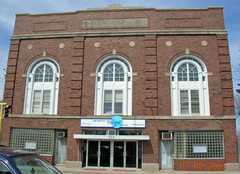 The city of Waukegan owned the building in 1991. Sometime after that, Sign of the Dove, a non-denominational Protestant church, bought the building; it still holds services there.